Erected in 1912, this 13-story building was converted to a cooperative in 1962. The attractive, light-beige brick structure has a one-story limestone base and second-story ornamentation over its canopied entrance. It has 31 apartments. It was designed by Robert T. Lyons for Bing & Bing and replaced two smaller apartment houses. Lyons was the architect also of the apartment buildings at 955, 993 and 1155 Park Avenue. Bing & Bing was one of the citys most important developers of apartment buildings in the first few decades of the 20th Century. Leo S. and Alexander M. Bing were "widely read, cultured, fastidious, and intelligent young lawyers" who "exuded a quiet confidence and favored a conservative appearance," according to Tom Shactman, the author of "Skyscraper Dreams, The Great Real Estate Dynasties of New York," (Little, Brown and Company, 1991). "Under their three-piece suits with high collars, the brothers concealed progressive sentiments. Alexander was much taken with the City and Suburban Homes model for development. Using their legal knowledge, the Bings formed a syndicate of investors to buy land along Broadway near intersections where subway or elevated lines were being constructed, resell the plots to builders, then provide them with loans for construction. During the [first World] war, Alexander Bing had been a housing consultant to two government agencies. He dreamed of following the path of the limited return City and Suburban Homes Company and became the spearhead of the City Housing Corporation, which produced a sprawling complex of one- and two-family homes and apartments in Sunnyside, Queens. Leo Bing split with Alexander in this era because he had a different objective: housing for profit." "That is good architecture, Leo told [architect Emery] Roth, which people are willing to pay for. To erect a building, however well it conforms to the standards of design, that does not produce the maximum of income is, to that degree, poor architecture. Every year, Roth would design a building or two (or sometimes three) for Bing & Bing, now Leos company, in every district from Greenwich Village to Washington Heights, from simple dwellings to palatial hotels and apartment houses," Shactman wrote. The hotels would include the Dorset on East 54th Street, which will be demolished for an expansion of the Museum of Modern Art, the Drake on Park Avenue and the Alden on Central Park West. Leo Bing also employed Philip Birnbaum for nine years as on-site inspector and Birnbaum would go on to his own architecture practice in which he became probably the most prolific designer of high-rise apartment buildings in the city. 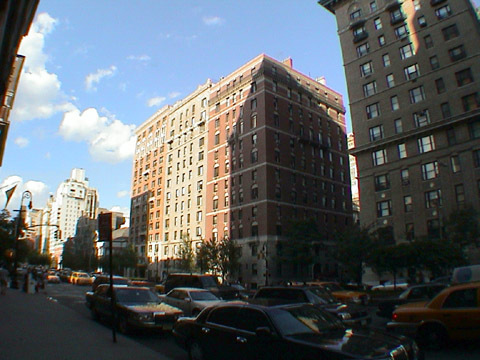 This building, which has consistent fenestration and protruding air-conditioners, is located in a very attractive section of Park Avenue that is convenient to midtown, many churches and clubs, fashionable boutiques and restaurants along Madison Avenue, Central Park and public transportation. The building has a canopied entrance with a doorman, but no garage, no health club and no sundeck.